GROWING UP PEDRO. Text and Illustrations copyright 2015 Matt Tavares. Reproduced by permission of the publisher, Candlewick Press, Inc., Somerville, MA. When author-illustrator Matt Tavares turns his focus on a children’s book topic, beautiful things happen. We love what he did with Growing Up Pedro: How the Martinez Brothers Made It from the Dominican Republic All the Way to the Major Leagues, a stirring picture book biography of the Dominican baseball great Pedro Martinez and his highly influential brother Ramón. Now we’re turning our focus on Matt himself, a prolific producer of books for kids, who agreed to answer a few of our burning questions. Latin@s in Kid Lit: Wow, your paintings are magnificent! They’re highly realistic yet deliver much more than faithful representation, in terms of their emotive power and aesthetics. Please tell us about your journey to professional illustration. Matt: Wow, thank you! That’s certainly what I always try to do, so it’s very nice to hear my pictures described that way. Even if I’m painting a realistic scene, there is always something I can do to heighten it, to go beyond what a photograph might show. Matt’s been drawing baseball figures since childhood. I’ve always loved to draw. Even when I was 4 or 5 years old, I thought of myself as an artist. I drew all the time, and knew I wanted to be some kind of artist when I grew up. It wasn’t until I was a junior at Bates College that I decided I wanted to illustrate picture books. I wrote and illustrated a picture book as my senior thesis. I spent my whole senior year working on it. After that, things happened pretty quickly- I found an agent who liked it, and she shopped it around to publishers, and found Candlewick Press. They basically asked me to do the whole thing over again with the guidance of an editor and art director, which I happily did. Then in 2000, Zachary’s Ball was published, my first book. LiKL: You’re not only an illustrator—you also write. Can you walk us through the process of creating a picture book, starting from the idea phase and ending with publication? Matt: Sure. The beginning part is pretty messy, where I just have all kinds of ideas floating around and I write everything down in my notebook. From there, most of the ideas just wither away, but every now and then one of them grows into something I think I might actually be able to work with. I always write the words first, then once I figure out how to divide it up into pages, I do rough sketches. And there is always a lot of back and forth between the words and pictures. 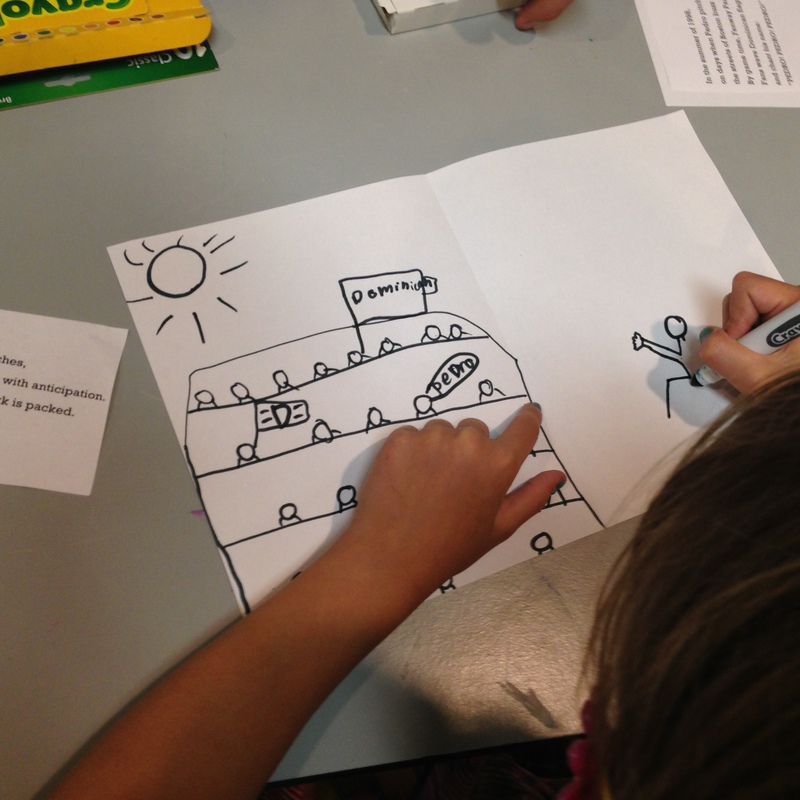 In a picture book, part of the story will be told with words and part of the story will be told with pictures. Once I start figuring out what the pictures are going to be, I realize I don’t need some of the words. Once all my sketches are approved by my art director (after a couple rounds of revisions, usually), I start working on the final illustrations. That part usually takes 4 to 6 months. The whole process, from start to finish, can take 9 months to a year, depending on the book. Then once all the illustrations are done, it’s about a year until it comes out in stores. 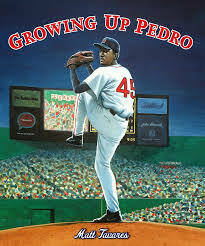 LiKL: By my count, seven of your published children’s books center on baseball stories, including Growing Up Pedro, your picture-book bio of Dominican major league star Pedro Martinez, which we reviewed in November. What’s your connection to the sport? Matt: Baseball is just something I’ve always loved. I grew up near Boston and have great memories of going to Fenway Park to watch the Red Sox play. When I was a kid, I was really into collecting baseball cards, watching baseball, playing baseball and wiffle ball. It’s one of the few things that has been a constant in my life from the very beginning. So when I started writing books for kids, baseball was a natural subject. Honestly, I wasn’t a big reader when I was a kid, but I would read anything if it was about baseball. I know there are still kids like that, and I hope they find my books! LiKL: Speaking of Growing Up Pedro, you must have done a great deal of research on Pedro Martinez’s life and career, not to mention baseball in general and Dominican life. Fill us in. Matt: This was my fourth baseball biography, but it was the first about a player I actually got to watch play. So this book was very personal for me. I read a lot of interviews and articles, but I also relied on my own memories of being at Fenway when Pedro was pitching. When he was on the mound, Fenway Park transformed into a different place. There was this electricity that surrounded him. I was excited to try to capture that in a book. In the Dominican Republic, local children were happy to pose for photos Matt would use in illustrating Growing Up Pedro. I also traveled to the Dominican Republic when I was working on Growing Up Pedro, which was amazing. Instead of just finding pictures online, I actually got to go to places that still look how they did when Pedro was a kid. I took tons of pictures. It was incredible to be able to go home after that trip and use all these experiences that were fresh in my mind and put them right into my book. It really helped me feel personally connected to the whole story. LiKL: On this blog, we highlight excellent kid lit that focuses on Latino/a characters, something you pulled off beautifully in Growing Up Pedro. As far as you can tell, has this picture book expanded your reach into the Latino community? Matt: Absolutely, and that’s been really great. I was thrilled when I found out Candlewick was going to do a Spanish edition of the book, because I know that Pedro is a hero to millions of Spanish-speaking people. I love knowing that kids can read Pedro’s story in English or Spanish. It’s such a powerful thing when a kid can see a bit of themselves in a character, and I think a lot of people have made that connection with Pedro. For some kids it’s because he grew up poor, or even just that he was skinny and small. But I think the fact Pedro is Latino definitely helps a lot of Latino/a readers feel more connected to the story. LiKL: Suppose you could hang around the studios of any three illustrators—living or dead—for the purpose of asking questions and observing technique. Who would those illustrators be and why? Matt: Tough to pick three… I’ll say Chris Van Allsburg, because he’s one of my all-time favorite illustrators, and I would love to watch him work. I would probably just take pictures of all his art supplies then go to the art store and buy all the same stuff. Maurice Sendak, because he was a genius and was always so fascinating in interviews. I never got to meet him. And Jerry Pinkney. I did a book signing with him once, and he was so nice and humble and approachable. He’s been making books for so long, and has had so much success. I’d love to spend some time with him and maybe pick up some good habits. LiKL: Naturally, we’re curious to know what’s next from Matt Tavares. If you’re free to share, tell us about books already in production, or a project still shiny with wet paint. Matt: My next book is Crossing Niagara, which is a picture book about The Great Blondin, the first person to walk across Niagara Falls on a tightrope. That comes out in April. Then I have another picture book biography that I illustrated with Candlewick that comes out in Spring 2017, about the first woman pilot. And right now I’m just starting final art for a book I wrote that comes out in Fall 2017. This one is going to be a very new direction for me- it’s fiction, and the main characters are birds. I’m very excited to try something new. Writer, illustrator, baseball lover! Learn more about Matt Tavares and his books at his official website. FROM THE BOOK JACKET: Before Pedro Martinez pitched the Red Sox to a World Series championship, before he was named to the All-Star team eight times, before he won the Cy Young Award three times, he was a kid from a place called Manoguayabo in the Dominican Republic. Pedro loved baseball more than anything, and his brother Ramón was the best pitcher he’d ever seen. He dreamed of the day he and his brother could play together in the major leagues. This is the story of how that dream came true. Matt Tavares has crafted a fitting homage to a modern-day baseball star that examines both his improbable rise to the top of his game and the power that comes from the bond between brothers. 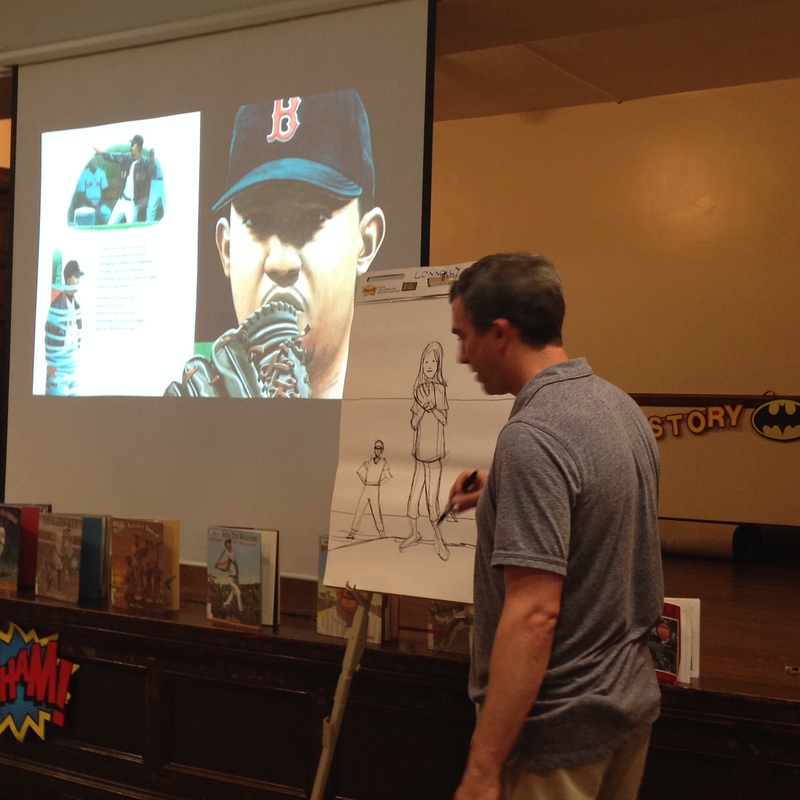 MY TWO CENTS: The author-illustrator Matt Tavares makes beautiful picture books, many of which explore stories from baseball. His sports biographies for young readers include Henry Aaron’s Dream, There Goes Ted Williams, and Becoming Babe Ruth. In Growing Up Pedro, Dominican major league pitcher Pedro Martinez takes a turn in the spotlight. At the peak of Martinez’s brilliant career, he pitched for the Boston Red Sox. In 2004, his performance in Game 3 helped the team capture a long-sought World Series championship. Martinez’s story abounds with tall achievements, but there are other, smaller points of inspiration in his journey, and this combination makes him an ideal hero for kid readers. Just as the title implies, Growing Up Pedro traces Martinez’s rise to baseball glory back to childhood years. As the story begins, young Martinez sits on the sidelines, riveted by his older brother Ramón’s ability to fire fastballs. Ramón is good—really good—but even as he pursues his own baseball dreams, Ramón takes the time to teach Pedro everything he knows about pitching. Sometimes they practice their aim on mangos, still clinging to the branches. When Ramón is drafted by the Los Angeles Dodgers, Pedro continues honing his skills on his own and ultimately captures the attention of U.S. talent scouts. After he joins his brother in Los Angeles, Pedro faces new challenges. He must work hard to prove himself to critics who consider him too small-framed to succeed as a major-leaguer. Before it’s all over, Martinez perfects a 97-mph fastball, wins the prestigious Cy Young Award multiple times, captures a World Series title, and lands a spot in the National Baseball Hall of Fame. Growing Up Pedro succeeds on multiple levels. First, it’s a story of dreaming big and achieving bigger. The narrative emphasizes that talent plus hard work make it possible for this young boy to rise out of obscurity and poverty. In one illustration, Pedro is shown alone, practicing outdoors at sunset. With Ramón already in the United States, Pedro’s internal drive to excel is what keeps him going, throwing pitch after pitch in the dying light. Growing Up Pedro also gives satisfying glimpses of rural Caribbean life, and it drives home the importance of baseball in the Dominican culture. At Campo Las Palmas, a Dodgers’ facility in the Dominican Republic, dozens of boys go through the thirty-day tryout alongside Pedro. Toward the end of the book, the narrative circles back around to the Dominican Republic. When an injured Pedro nevertheless pitches and sends the Red Sox into the American League Championship Series, Tavares’s paintbrush fills in scenes of celebration on the home front, where fans gather in front of television sets to watch Pedro. Following his success, “people dance in the streets. Kids tie scraps of metal to their bikes and ride through the darkness. Sparks light up the night like fireworks.” This is a transcendent moment that extends the hero’s journey into something bigger than himself, into a victory for all his people and for other dreamers, near and far. Matt Tavares is a prolific writer and illustrator of children’s books. His work has received starred reviews and high honors, including three Parents’ Choice Gold Awards, six Oppenheim Gold Seal Awards, and an International Reading Association Children’s Book Award. Matt’s original artwork has been exhibited at major museums. He’s a popular speaker and presenter to adult and child audiences alike. Visit his official website to learn more. Visit Pedro Martinez’s page on the National Baseball Hall of Fame site. The Dominican Republic boasts a jaw-dropping number of players in the ranks of professional baseball. This website provides an informative chart. Watch a highlights video of Martinez pitching a 17-strikeout game in 1999. Lila Quintero Weaver is the author-illustrator of Darkroom: A Memoir in Black & White. She was born in Buenos Aires, Argentina. Darkroom recounts her family’s immigrant experience in small-town Alabama during the tumultuous 1960s. It is her first major publication. Lila is a graduate of the University of Alabama. She and her husband, Paul, are the parents of three grown children. She can also be found on her own website, Facebook, Twitter and Goodreads. The first question I get is usually: “How could you write in the voice of a thirteen year old Latino boy?” I am about as far as you can get culturally from a young adult Latino just barely hanging on with his mother. But of course, if you are a writer, you are so many people that biographers will never get it straight. It is the same way I wrote in the voice of an old African American man in Tobacco Sticks and in Mica Highways. I never knew I had an arm until this guy calls out, “Hey, you want to try and get a ball in the hole, sonny?” I am only nine, but Mom says, “Come on, let’s play.” This carnival guy with no teeth and a fuming cigarette hands me five blue rubber balls and says I throw three in the hole, then we win a prize. He’s grinning, because he’s taken Mom’s five bucks and figures a sucker is born every minute. This really gets me , because we didn’t have any money after Fernando took off, and he only comes back to beat up Mom and steal our money. So I really wanted to get Mom back something, you know, for her five bucks. And I had Ricky then. I had the novel. And where that voice came from is anyone’s guess. Maybe it is that kid who messed around in Baltimore City where I grew up. Maybe it was some of the Mexican guys I worked with in security. And the hard times Ricky and his mother go through are my own hard times. And the baseball is my son’s baseball and the coaches and parents are from nine years of being an assistant coach with my son. The immigration issues are from our time. When I was thinking about writing The Pitcher, I was reading what was going on in Arizona at the time with immigration and the whole stop and ask people for their papers to deport them back to Mexico. When I wrote the mother character Maria I wanted her to have the same outrage that I felt reading about this practice of stopping people and demanding to see their papers. I wanted her to draw the conclusions that this was fundamentally un-American and I wanted her son Ricky to pick up on that especially since he was facing off with a Tea Party mom and her son. I read a lot of accounts about Dream Kids in this country and how they had made their lives and then were in danger of being deported. That was really how I got the idea of making Ricky a Dream Kid. His mother did come over and make a life and now she was in danger of being deported. Culturally, I knew Ricky because I know how it feels to be an outsider and to have all the odds stacked against you. Ricky’s dream of becoming an MLB pitcher is my own of becoming a novelist against immense odds. Then again, maybe it was just Ricky flying around out there waiting to be born. But when The Latina Book Club made it their Monthly Selection or LatinoLA did a story on the immigration issues in the book or I stand up on a stage at the Latino Book Festival in Chicago and read my book that has to be translated to Spanish so the audience can understand what I am saying is…even I wonder how a I came to write a Latino novel. I guess I just did. 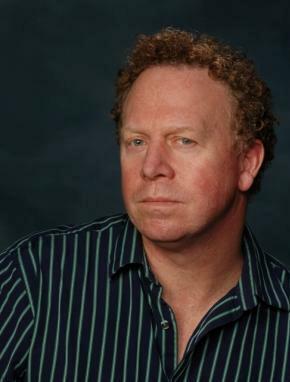 William Hazelgrove is the author of five novels, Ripples, Tobacco Sticks, which hit the National Bestseller List, Mica Highways, Rocket Man and The Pitcher. He was the Ernest Hemingway Writer in Residence where he wrote in the attic of Ernest Hemingway’s birthplace. He has written articles and reviews for USA Today and other publications. He has been the subject of interviews in NPR’s All Things Considered along with features in The New York Times, LA Times, Chicago Tribune, and the Chicago Sun Times, among others. 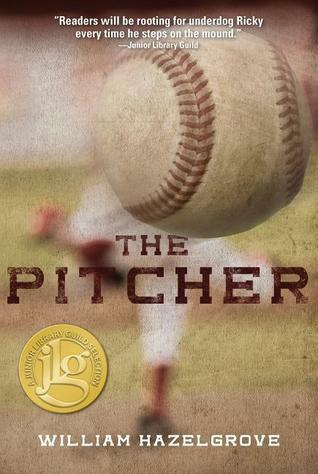 His most recent novel, The Pitcher is a Junior Library Guild Selection. He runs a political cultural blog, The View From Hemingway’s Attic.